Choose Settings on the Start menu. The Settings window opens. 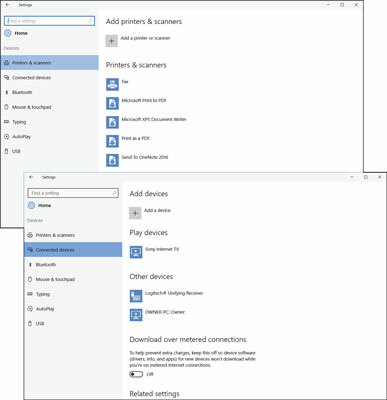 Choose Devices to open the Printers & Scanners category of the Devices window, as shown in the top of the figure. Note the printers and scanners (if any) that are connected to your computer. Select the Connected Devices category in the Devices window, as shown in the bottom of the figure, and scroll down the screen to see all your devices. Devices listed may include your monitor, speakers, headphones, keyboard, mouse, and more. Devices shared through your homegroup or network also appear here. You are unlikely to need the Add a Device button because most devices are added automagically (that’s a word nerds like to use). However, if you select Add a Device, Windows 10 scans for additional hardware. No harm in doing so.